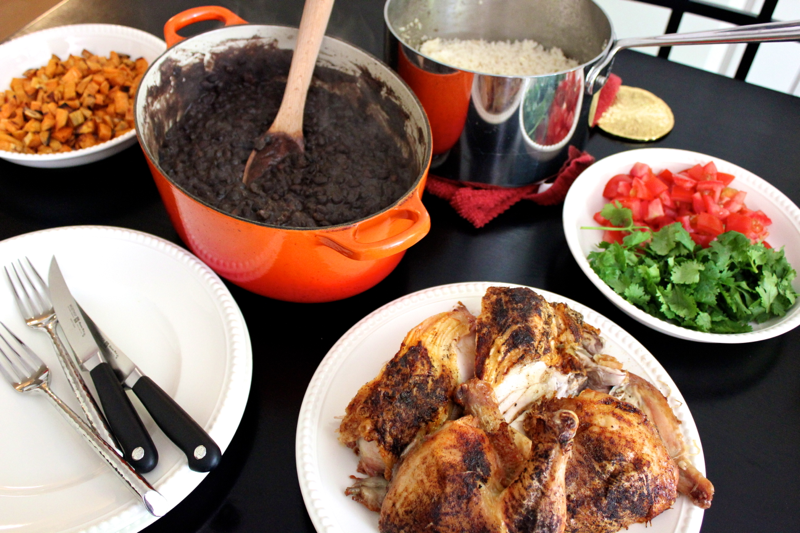 Although you can’t have a Cuban feast without black beans, there are also other important components of the meal to consider. Rice and chicken are essential, and fried plantains make for a sweet palate cleanser. 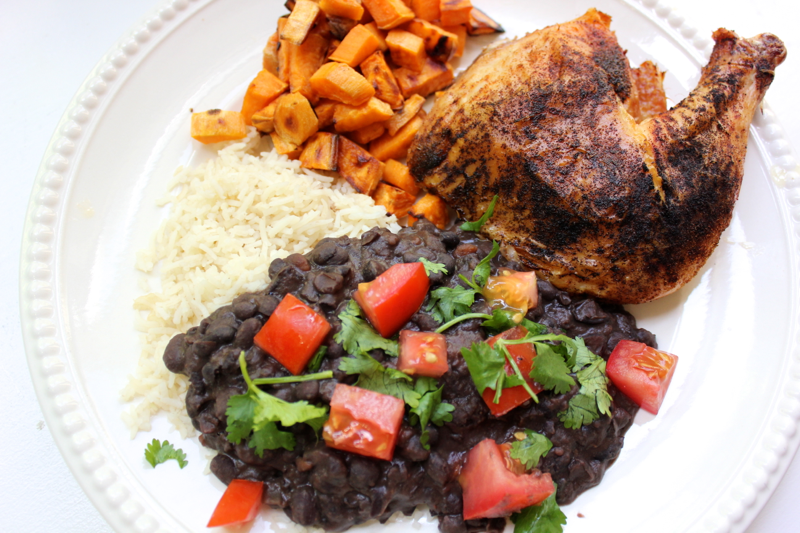 I swapped the plantains with baked sweet potatoes because I had them on hand. Once the necessary elements have been prepared, load up your plate and fill your belly! Start by preparing the chicken. Get a smaller 3 to 3.5 pound chicken, and spatchcock it. Cut out its spine with kitchen shears, spread open the chicken’s rib cage, and place the flattened chicken breast-side up on a cast iron skillet. Sprinkle some cumin and smoked paprika over the chicken (and salt if not using a Kosher chicken), and rub it into its skin. 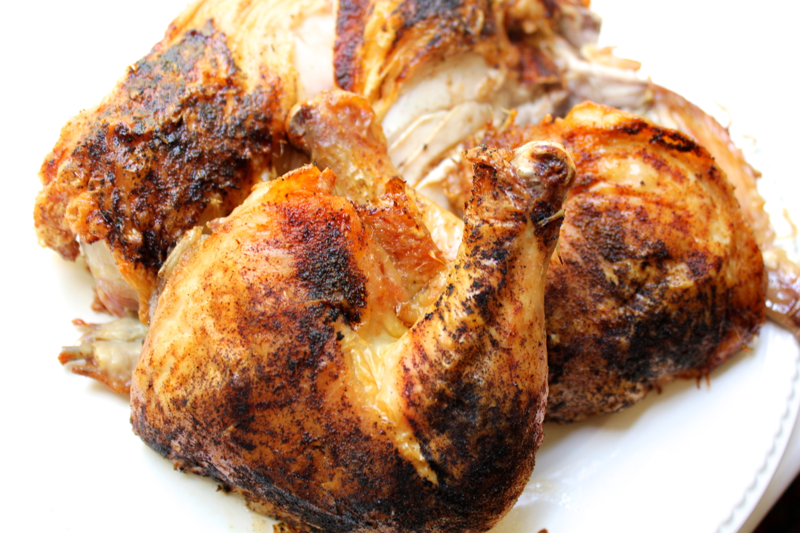 Roast the chicken in a 450º oven for 40-45 minutes until it is fully cooked. Let the chicken rest, and then cut it into pieces. Next, prepare the sweet potatoes. Dice 2 sweet potatoes into 1/2 inch pieces. Spread them on a baking sheet, and coat them lightly with vegetable oil. Season them with salt and pepper, and roast them in the 450º oven for 10-15 minutes, tossing them around half way through the cooking time, until they are browned and caramelized. 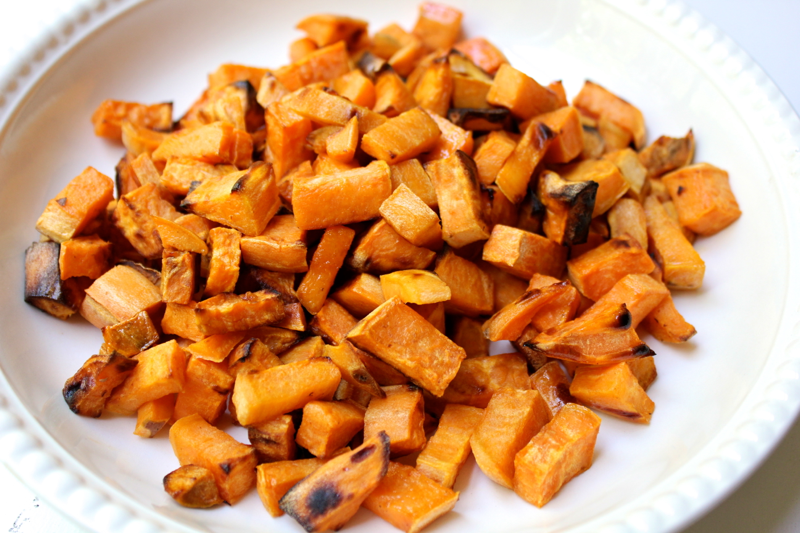 These sweet potatoes are like candy! And where would we be without rice?! 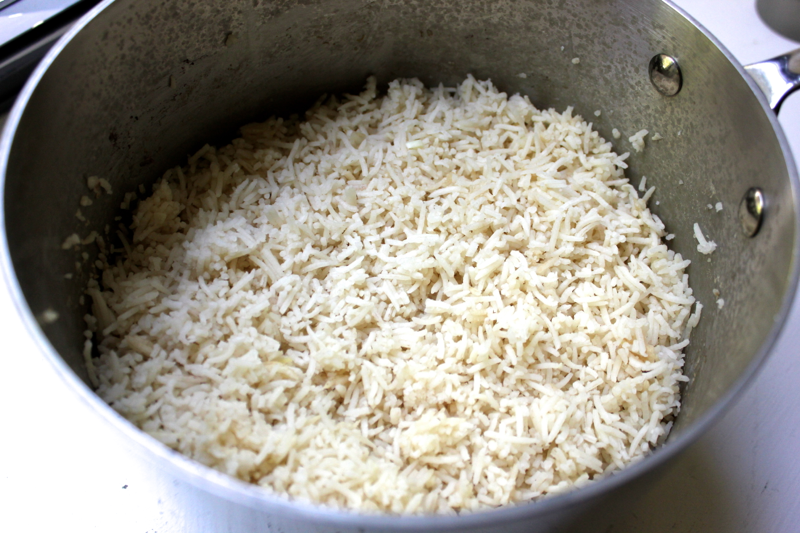 Measure 2 cups of jasmine rice, and cover it in water to jumpstart the rice’s absorbing abilities. To a pot, add 3 cups of chicken stock (water would also be fine but less flavorful), 1 tablespoon of butter, 2 minced garlic cloves, and salt to taste. Bring the liquid to a boil. Drain the rice from its soaking water, and add the rice to the pot. Reduce the liquid to a simmer, put a lid on the pot, and let the rice cook for 15 minutes or until the liquid is fully absorbed. Fluff the rice with a fork before serving. Don’t forget your condiments! 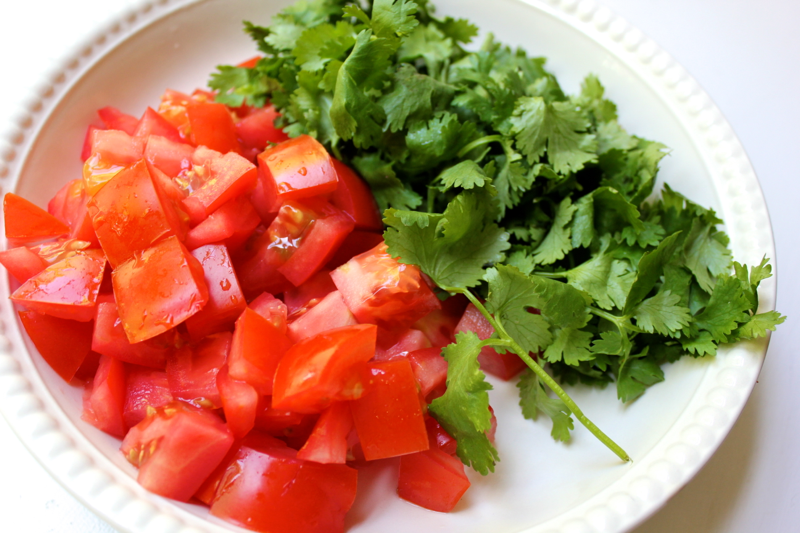 Diced tomatoes and cilantro leaves are great for sprinkling over this meal. The Cuban fast food restaurants also serve a bunch of different dipping sauces, so you can get creative with those too. And then, as I said, load your plate! A little rice here, a lot of chicken there. Just thinking about this meal makes me hungry for it again. Good thing some black beans are stashed away in my freezer!